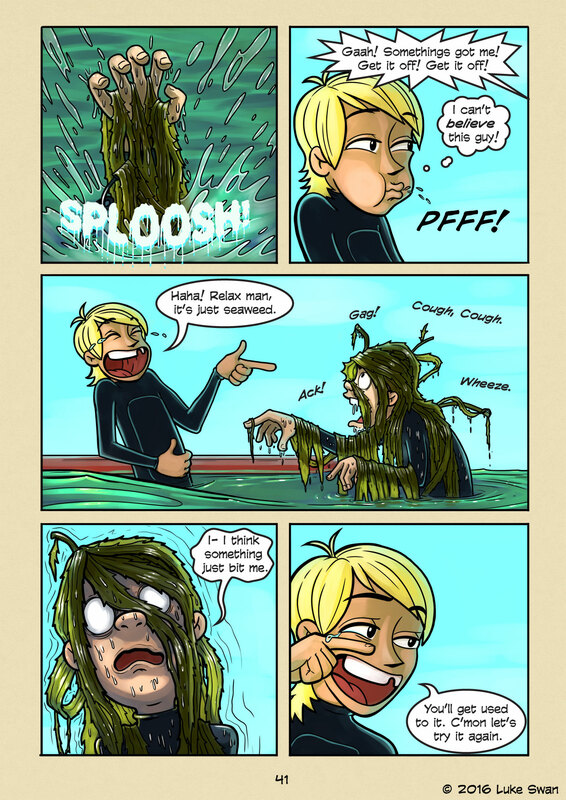 Covered in Seaweed (#041) | Web comic "Surfer Joe"
One of the trademarks of Shobuta beach is the copious amounts of seaweed. Mostly all the seaweed washes up to shore, but when it’s really bad it hangs out in the shore break. It can be pretty gross. I remember a period in my teens when I didn’t like going into the water because of having to wade through all of it. I don’t really know how it gets there. My best guess is that there is kelp harvesting industry in the area. What the harvesters don’t keep they throw back into the ocean and it floats to shore. The kelp is natural and from the ocean so why not? Because it ruins some beachgoers experience? Talk about first world problems. “First world problems” is a term I’m hearing a lot these days. I suppose it’s a way to keep things in perspective, a reminder that we actually have things pretty good. We need a way to keep in check our inner desire to be constantly improving our living existence. Our lives constantly revolve around acquiring more things, improving our bodies and attitudes. So when we get bent out of shape about something trivial we have to remind ourselves “Hey, things could be a lot worse. I could be a starving AIDS baby in a 3rd world country somewhere.” And that helps us let go, or gives us the confidence to improve our situation further. I think the term is less a show of empathy than it is a way to keep us moving forward. We are constantly fighting against the clock, fighting our own decay. We do it so we can… do what, exactly I’m not sure. To achieve something, maybe. To be remembered after we’re gone. It’s fascinating to me how much this matters to us. It matters to me. I get caught up in it all for sure… maybe it’s best not to question why.